On paper, we knew that the Motorola Atrix HD compared well to what the Samsung Galaxy SIII and the HTC One X offer. Still, we were skeptical the Atrix HD could fight on a par with handsets $100 more than its $99 (or $49 at Best Buy) price tag. Motorola claims the Atrix is Slimmer, Stronger, Smarter than its older sibling, the Atrix 2. The Atrix HD lacks NFC and is short 8GB of storage, when compared to the Galaxy S III and the One X, but it managed to keep up in a lot of other ways. The Atrix HD has a slightly smaller screen (4.5 inches) compared to Galaxy S III's 4.8-inch screen and HTC One X's 4.7-inch display (but packs in the same resolution, which allows for a crisper display). There's a small difference in specs, so let's see why the Motorola Atrix HD is a worthy (and budget friendly) competitor to our two favorite AT&T phones. The Atrix HD has a great build quality. It feels sturdy in my hands and, despite the slightly heavier weight (140g, SIII: 133g, One X: 130g), the quality build and low price may entice potential buyers. The Atrix HD's design isn't as similar to the Atrix 2 as it is to the Motorola RAZR family on Verizon Wireless. Imagine if the Motorola RAZR and the RAZR MAXX begat a child: you would end up with the Atrix HD. If you've used a Motorola RAZR (Atrix is not as sharp-edged), it will feel a bit chunkier, but not too much; the added girth and weight is noticeable, but it also feels more solid and the added battery capacity (compared to the RAZR) is a big plus. Unlike phones that employ a plastic casing, there is nothing flimsy about the Atrix HD. It definitely feels like it could withstand a bit more impact than the Galaxy S III and HTC One X. In fact, I accidently dropped the Atrix HD one afternoon and, as advertised, it is KEVLAR strong. Even though it has a smaller display than our two favorite AT&T devices, the Atrix HD packs in the same screen resolution, which allows for a crisper display. The touted HD display does not disappoint — it's clear, bright and can be viewed easily under direct sunlight. The display is fitted with Corning's Gorilla Glass that further beefs up credentials for being built for rugged use. The front of the Atrix HD has the AT&T logo on the bottom bezel of the display; don't be fooled (as I was a few times), it is not the Home button. The Motorola Atrix HD packs the same Qualcomm Snapdragon S4 processor clocked at 1.5GHz as the Samsung Galaxy S III and One X. The Atrix HD performs tasks at the same zippy speed we expected from leaders of the mobile phone pack. The Atrix HD also fell in line with the One X when compared to other mobile devices through Quadrant Benchmark tests. One of our biggest complaints about most encased devices is the lack of a removable battery and the ability to add extra storage via a microSD card slot. While the Atrix HD still lacks the ability to swap out batteries, you do have the ability to add in up to 32GB through the phone's microSD card slot. That's one feature the One X lacks. It would be nice to be able to swap out batteries on the go, too, but what you lose in modular battery compartments, you gain in ruggedness. The 720p front facing camera worked as advertised. On a test call to our editor-in-chief, Sean, the quality of the video and audio was clear on both ends and we were very happy with the performance. We tested the 8.0 megapixel rear-facing camera in low light, sunny, overcast and indoor fluorescent conditions. We very disappointed in the camera's results in each environment. Shooting on the camera is just a tad slower; about half a second slower than the Galaxy S III and HTC One X. Photo quality was subpar and most photos were blurry. Though it advertises an 8-megapixel camera, the Atrix HD falls short to the competitions' superior camera sensors. When we evaluate smartphone camera capabilities we tend to focus on speed, clarity and noise to conclude just how satisfied we are with the unit's camera. Unfortunately, the Atrix HD fell behind in all of those categories. Of note, the Atrix HD did shoot at a faster speed than the RAZR's camera does. The Atrix HD has additional shooting modes beyond the single-shot shooting option, including panorama, multi-shoot and timer. The panorama mode delivered blurry and slightly skewed images. The multi-shoot mode snaps series of successive photos and is quite useful. We found we relied heavily on the multi-shoot option more because the regular single-shoot mode tended to result in blurry photos. One feature we would have liked to see is a macro-shooting mode for extreme close ups of bugs, flowers or text. The Atrix HD had a difficult time photographing flowers up close. Atrix HD packs in a few more effects for good show, but there's nothing really to note there other than, you can "sepia-tone" to your heart's desire. Like Atrix HD's photo quality, HD video is noisy and often displays colored flecks across the footage. However, in terms of audio, Motorola Mobility has packed in more features to help capture audio more accurately (e.g., stereo, wind reduction, concert, balanced, front facing). There is a time-lapse mode to the video recorder, though I'm not sure how useful of a mode it is. It is fun, but my arms sure were tired from holding the phone for more than 3 minutes for just 3 seconds of footage. The Atrix HD runs on Android 4.0.4 (shipped), with very minimal Motorola customization. Motorola has preloaded the Atrix with SMARTACTIONS™, which is a free app that figures out your daily routines to make daily tasks easier. This app turns on or off text message alerts/social media/sounds/GPS depending on whether you're home, working, on the road or sleeping. It is a neat feature that basis the actions on your location, but I can think of a few instances where NFC would come in handy for activating music, car mode and more manually. more. Samsung has TouchWiz, HTC has Sense, and Motorola left the Google Android's Ice Cream Sandwich pretty much unchanged outside of adding a few widgets, ala Circles. Motorola's Circles allow users to reference information quickly, but it's not incredibly useful. We did appreciate, however, that there are embedded arrows in the Phone and Browser icons that quickly display the most recent calls or browser bookmarks when flicked up or down. The circles also add a different take on widgets and, in some respects, are very useful to get a lot of useful information crammed into a very small area (e.g., time, date, weather). Motorola's lock screen Quick Launch option is speedy and useful, but we prefer the options on the Galaxy S III and the One X. One drawback to Atrix HD's lock screen is the icons (e.g., unlock, camera, text, phone) remain hidden until you tap the key icon. Typical AT&T (e.g., maps, Yellow Pages, account information) bloatware comes pre-installed on the Atrix HD along with a Vehicle Mode app that appears to sync with an in-car dock. Otherwise, you're free to add (or remove) as many apps as you want from the Google Play store. One of our biggest issues with 4G LTE smartphones is that radio usage diminishes the battery quite drastically. Motorola states that the encased 1,780mAh battery provides nine hours talk time on 4G LTE and 8.5 days of standby time. In our test run we gauged just below 11 hours of total use. (See image for the breakdown), but after two hours of talk, the battery was depleted by 35 percent. Sending 4 images via email drained another 9-10 percent of battery capacity. We would say the battery does not live up to Motorola's claimed results. It may be worth the purchase an additional external battery charger or keep it charged throughout the day. If larger battery capacity is a key feature you require, we suggest you try other phones. The call quality offered by the Atrix HD is among the best I've experienced on AT&T's network. I don't live in a very cell friendly area and I usually get one to zero bars at home (EDGE, 3G or LTE). Having used the iPhone, Samsung Galaxy Note and the HTC One X, this is the only phone that did not drop on me during my trial period. Even on a lengthy half hour call, I maintained full coverage and did not experience any issues with call quality. Editor's Note: If you opt to use the speakerphone you may choose to turn your phone over, with the screen facing down and the speaker facing up. I found the speaker to be a tad bit muffled (not significant) when sitting flush to a table. Data speeds were on a par with AT&T's other 4G LTE devices. I found the Atrix HD wasn't as speedy as Todd's results from his review of the Galaxy S III or the HTC One X in NYC, and my average download speeds sat around 6Mbps. My average upload speeds hovered between 4-5Mbps. We're giving the Atrix HD a rating of 7.5 out of 10. Despite the camera not being up to par to the top phones on the market, it is hard for us to give a bad review of the Atrix HD because the phone worked really well. Plus, its price makes it even sweeter. 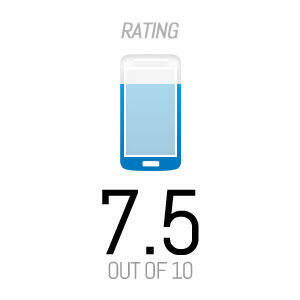 For more information on how we rate phones be sure to check out the guide to our mobile review scoring format.